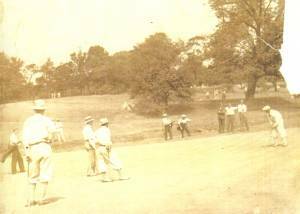 Competitors in a 1926 pro-pro tourney at Bala putt on the 18th green. One hundred and two people, 24 of them women, signed up. How many chose to take advantage of the bargain one-time payment we do not know. What we do know is that solid support for the fledgling organization was now a matter of record. The founding fathers—James A. Logan (the club’s first president), E.H. Hanson, C.W. Klauder, G.H. Strawbridge, T.A.C. Baker (his son Hobey would be commemorated as the "beau ideal" of Princeton University athletics in a very widely read book. The Legend of Hobey Baker), H.P. Gardner, C.D. Hickman, T. William Roberts, James A. Logan, Jr.—now moved to draw up the charter, acquire property, and, on Jan. 21, 1901, incorporate the Bala Golf Club under the laws of the commonwealth. Membership was limited to 150 men and 100 women. Access to the club by public transportation was good—you took either the train from Broad Street Station or the Fairmount Park trolley. The club’s original course, laid out by Willie Tucker, measured 2,647 yards against a par of 35 1/2. The ground was rolling and holes were routed on both sides of the railroad. The Golfers’ Record, published in 1903, referred to the turf as "generally speaking, close and thick, and ’velvety’ lies are the rule and not the exception." That early publication goes on to say that "the membership never tires of reciting ’experiences’ in the awe-inspiring pond hazard. That drowning caddies have been rescued from the depths of this pond, and that certain members have taken swimming lessons before attempting to play in the neighborhood are indisputable facts, and eloquently bear witness to the unique possibilities of the course." Only two holes—the 416-yard 4th and the 385-yard 8th, both par 4 1/2—called for a bit of brawn. Bala, then as now, was a short course, where precision and finesse were the principal requisites. The club’s guest policy in the early days was an unusual and magnanimous one. Members were permitted to have as many guests as they wished, but a nonmember visiting the club more than once a month was charged 50¢ per day. Rather a far cry from the $50, $75 and $100 guest green fees that are now commonplace at so many clubs. But then, the $5/6 pledge made by 102 members in 1900 was a far cry from the $5 or $6 million offers made by shopping mall developers for the club today—and heroically rejected by the Bala members. 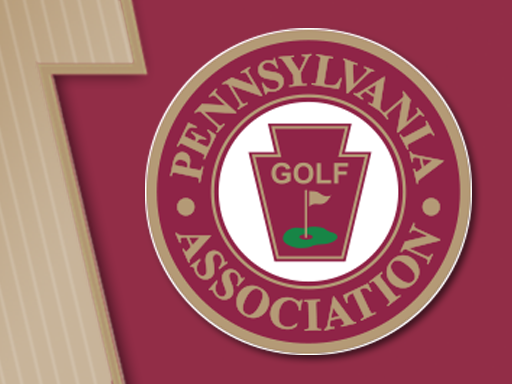 For more information on Bala’s history, check out the Golf Association of Philadelphia Magazine story on the club’s 115th birthday, which appeared in the Spring 2016 edition.